Before we came to Paris I had read about the Picard chain of food stores and was eager to visit one for myself. These stores are devoted to frozen foods (with only a few non-frozen items to be found) and have many locations around the city, as well as throughout the rest of the country. Once I knew to look for its distinctive snowflake logo, I started seeing Picards everywhere (not unlike certain Star Trek episodes). 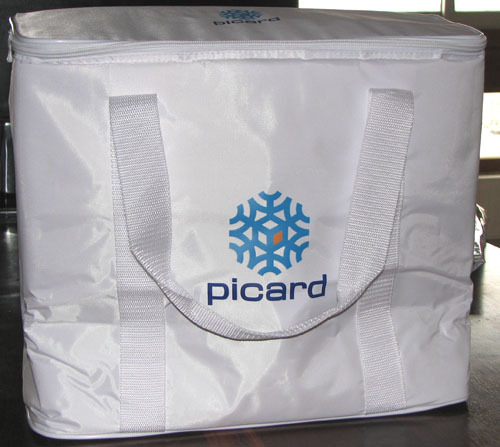 To our delight, there is a Picard store about six blocks from our apartment, which makes it possible for us to get the stuff home before it melts even a little bit. A few weeks ago we made our first major shopping trip to this store, confining ourselves to buying only the basics, although we were sorely tempted by the vast array of frozen pastries and luxury items likes foie gras and escargots. It tickled us that we could buy a frozen quiche lorraine, or ratatouille, or canard a l’orange; it was like a culinary tour of France in a freezer case. Although we are looking forward to experiencing all the regional specialties of France in their natural state, it doesn’t hurt to have a few frozen goodies on hand when dinner time comes around. I like Picard. I don’t buy prepared food from them, but frozen vegetables (peas, green beans, even frozen corn) that you can’t get elsewhere, or only during a short season. They also have good fish and some good frozen fruits – it’s the only place I’ve found cranberries outside of Paris. The prepared food is expensive, though, but it’s as good as or better than other frozen food brands. Also, many of these stores deliver (I don’t know if they do in Paris, but in the provinces they do). So that’s a good deal if you buy frozen stuff regularly and don’t want to hassle with the “chaine du froid”. Yes, we’ve been enjoying many of the things you mentioned (fish, green beans etc.) and a few less expensive prepared items as well (such as a really good couscous and vegetable dish). I guess we could opt for delivery, but with our spiffy insulated bag (see photo) we’re not too worried about the food staying cold until we get home. You’re close enough – we’re an hour away from the nearest Picard. There are other frozen food chains that deliver directly from trucks: they leave you a catalog, you call them, and they come to your home with what you’ve ordered. Very nice in a rural area!